The largest villa within The Asmara Villa Heavenly Residence portfolio, Villa OMG was named from the gasps of spontaneous surprise on arrival to the villa. That awe is well deserved – at 700 sq m (7,534 sq ft) and with 180-degree ocean views it literally appears as though the Indian Ocean has been laid at your feet; a wide and endless aqua blue sea. 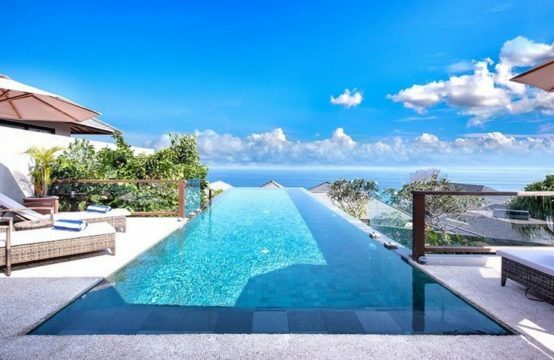 A 25 metre infinity-edge pool perches on the hill side fronting the ocean. Once out of the water, there is a long ironwood sundeck, complete with a bale and lawn all offering equally splendid views. With a guest capacity of 80, a more dramatic setting for a glamorous party, wedding or other event would be easy to imagine. Apply named – Villa ‘O-Wow!’ offers just that – amazing views, amazing experience. Entry to the villa is via a private lift from the underground car-park directly into the villa with the lift doors open right into our garden in the sky. At 600 sq m (6,458 sq ft) of living space, it is almost as spacious as Villa OMG. The layout is a minimalist-modern interpretation of a Balinese compound, with three double bedrooms and one twin bedroom arranged within landscaped gardens. The centre-piece is an infinity-edge pool situated just over a sheer drop towards the sea, giving the appearence of pouring directly into the horizon. Views throughout the compound are spectacular and it feels especially dramatic when enjoyed with a cold drink in hand, floating at the lip of the pool. Villa ‘O-Wow!’ is ideal for two or three couples to share or a family looking for that very special accommodation. “ASMARA” meaning “Romance” is exactly what is offered at “Heavenly Residence” Nusa Dua – unwind and pamper yourself in the privacy of your self-contained villa. With 24 hour Butler service, your own private pool overlooking the glorious Indian Ocean and all the trimmings of a 5 star retreat, you will lose yourself in the magic and romance of The ASMARA “Heavenly Residence”.